At Chenal Restoration, we’re dedicated to finding innovative ways to save and restore your property and possessions to pre-loss conditions. If you have experienced a disaster from water, mold, fire or smoke, you will want to get back to normal as soon as possible. 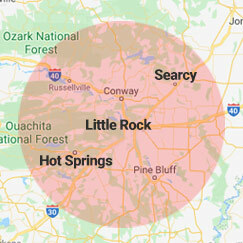 We are glad to serve the Little Rock, Hot Springs, Conway and Benton areas and have substantial experience in all three areas! Most restoration companies believe it is necessary to discard everything and start from scratch. That process can be very costly in terms of time, money and headaches. We believe in a concentrated approach on what exactly needs to be remedied. For example, if a section of the kitchen floor has been damaged by water, then we focus on fixing that specific section, not overhauling the entire kitchen. Our team can handle any situation involving the restoration of your property or valuable possessions, whether it’s in the form of fire damage, water damage, or in many cases mold and smoke. Often times it’s also a matter of being able to notice where there’s damage the owner might not even know about. We can offer trained eyes to come in, assess the situation and then get to work improving things. At the same time, we’re able to notice possible problems before they become an issue. It’s always better to head off a problem before it really becomes an issue. Our trained team knows the signs of potential problems with water damage, fire hazards and similar situations. We can find them, fix them and prevent hundreds or thousands of dollars of property damage before it happens. We’re devoted to keeping buildings safe and beautiful, whether it’s an office or your home. Contact Chenal Restoration today for any fire or water damage needs!